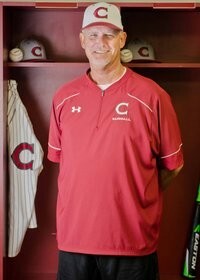 Coach Ken Smith is in his twelfth season on the Chiles Baseball coaching staff. A 30-plus year coaching veteran and former standout pitcher, Coach Smith brings a wealth of baseball knowledge to the varsity pitching staff, including 6 years of head coaching experience (both at the high school and junior college levels) and over 20 years of experience coaching pitchers in Ft. Lauderdale, Orlando, and Tallahassee. After high school, Coach Smith walked on to pitch for Broward Community College, and later, at local D1 powerhouse, Florida State University. After college, he was drafted in the 21st round by the NY Yankees organization and played 3 years in the minor league system, getting as high as AA in Nashville, TN. Coach Smith a member of the Chiles math department and also coaches the boys golf team which has qualified for the state tournament 7 times, the last 6 have been consecutive! His son, Cooper, is currently on the Chiles Babe Ruth team and will be a freshman at Chiles next year.